Nevertheless, lots of parents are asking the question, "Should I get my children vaccinated against the measles?" I'm going to try to give you the most rational answer here regardless of whether you're pro-vaccine or opposed to vaccines on principle. But first, realize that the one-dimensional advice from the conventional media and health authorities is stupidly incomplete: "Everybody get vaccinated!" Can measles vaccines work to protect against measles? Absolutely they can in some people, but they are not without their own risks as you'll see below. Despite the way I have been deliberately mis-characterized by others, I am not opposed to the theory of immunization. In fact, I'm the author of "A Blueprint for Safer Vaccines" which argues for the creation of clean vaccines formulated without toxic ingredients used today such as mercury, MSG, aluminum and formaldehyde, all of which the CDC openly admits are still used in vaccines today. The vaccine industry (along with the mainstream media) dishonestly positions vaccines as offering 100% protection with 0% risk. That's a lie. My job is to help you navigate the health propaganda so that you can make an informed decision about the possible risks vs. possible benefits. 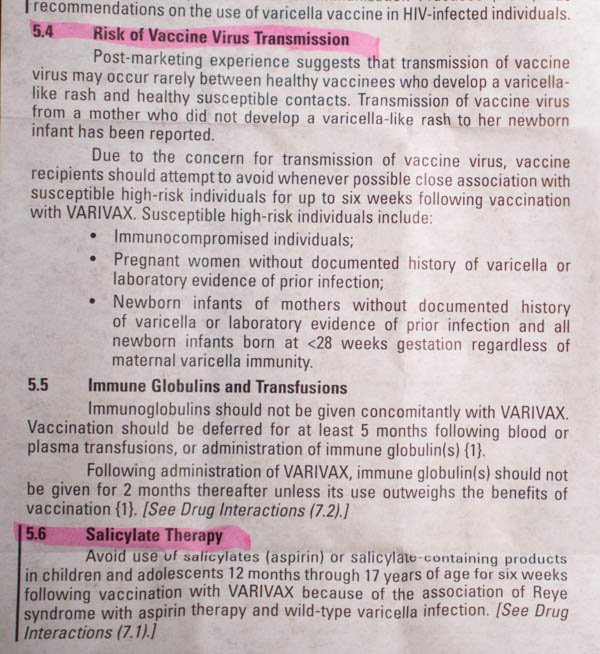 The most important thing you can do when considering any vaccine is READ THE VACCINE INSERT! 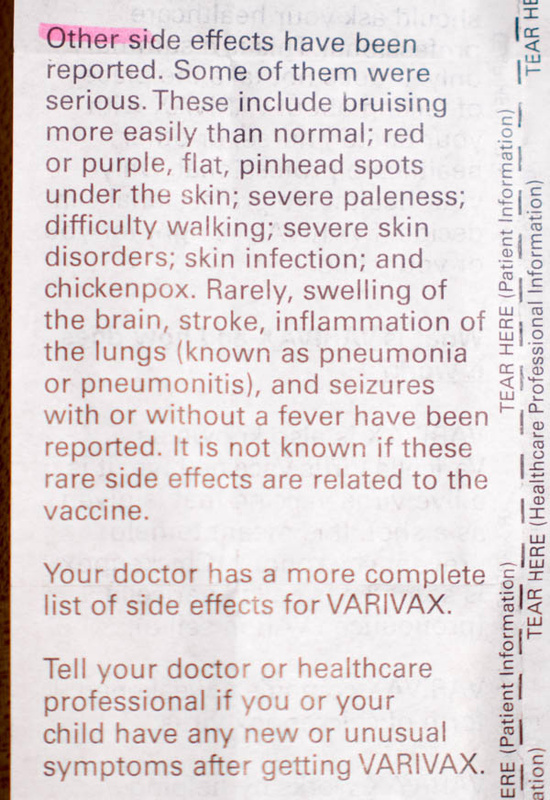 I collect vaccine inserts in an effort to document the history of medicine, and although I don't yet have a measles vaccine insert, I do have one for a very popular and widely-used chickenpox vaccine. Where's the science behind the vaccine? 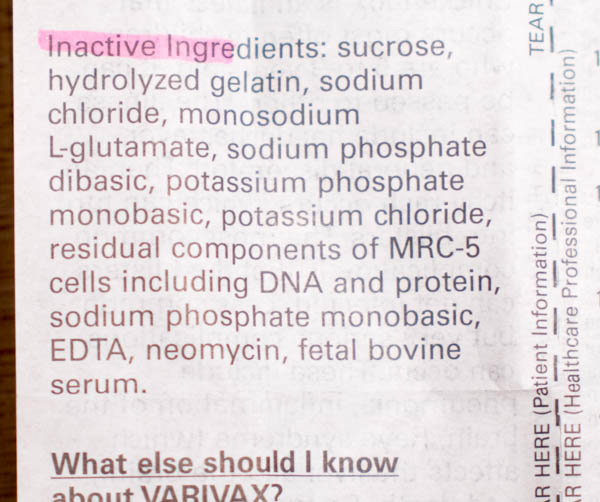 In nearly microscopic small text, this vaccine insert admits, "No placebo-controlled study was carried out with VARIVAX using the current vaccine." Every vaccine insert must list the adverse effects (negative side effects) which have been reported in clinical trials following vaccination. ...nausea, vomiting, abdominal pain, Guillain-Barre Syndrome, Bell's palsy, non-febrile seizures, paresthesia and many more. 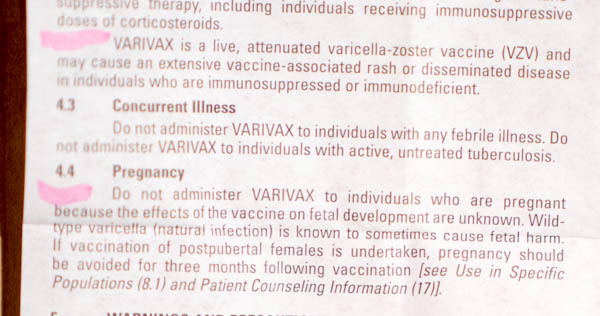 In many vaccine inserts, you'll find a warning that admits a person who receives the vaccine can then go on to spread the disease they were just vaccinated against. "Post-marketing experience suggests that transmission of vaccine virus may occur rarely between healthy individuals who develop a varicella-like rash and healthy susceptible contacts." Check the ingredients: Do they include MSG and toxic metals? Many vaccines are made with monosodium glutamate, the excitotoxin taste-enhancing chemical that destroys brain cells. It's also common to find vaccines formulated with mercury and aluminum. sucrose, hydrolyzed gelatin, sodium chloride, monosodium glutamate, sodium phosphate, potassium phosphate, potassium chloride, neomycin (an antibiotic), EDTA and fetal bovine serum. 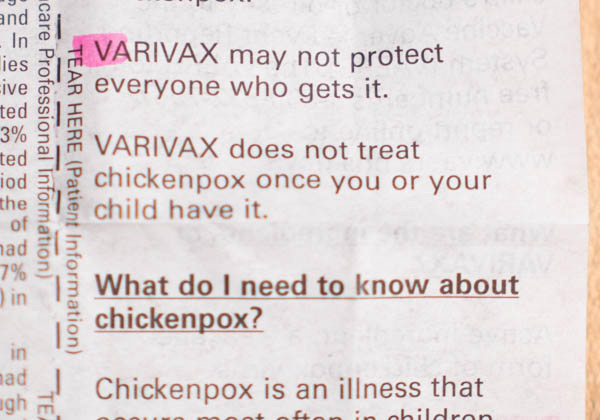 Here's a warning not to take aspirin after being vaccinated, along with yet another warning that taking the vaccine can cause you to spread chickenpox to someone else. 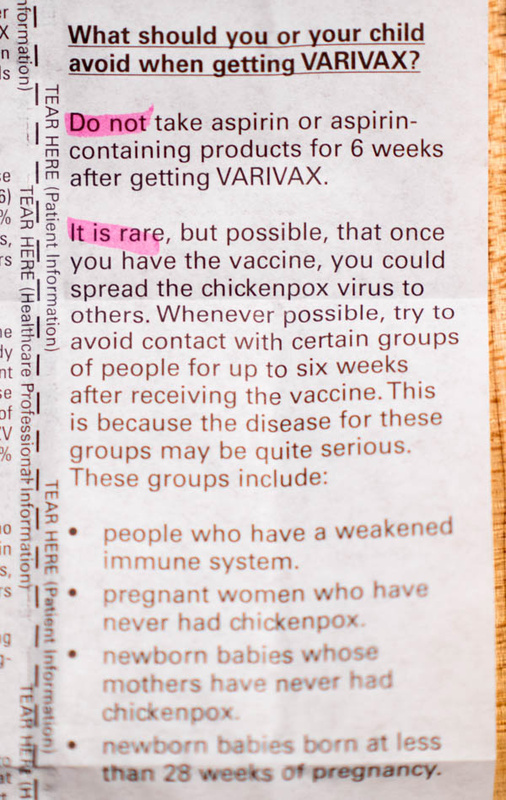 It states, in plain black and white: "It is rare, but possible, that once you have the vaccine, you could spread the chickenpox virus to others." severe skin disorders, swelling of the brain, seizures, inflammation of the lungs... and so on. Have you read the measles vaccine insert? 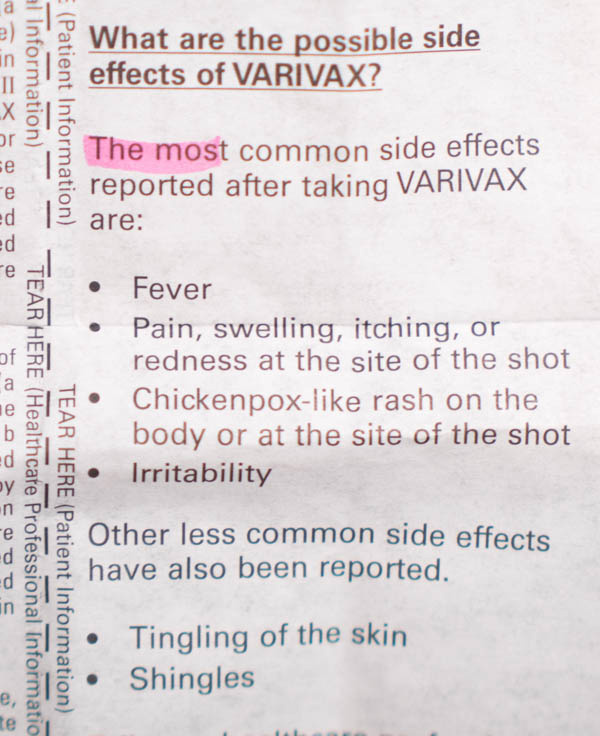 As you can see from the insert photos shown above, vaccines say all sorts of fascinating things on their legally required insert sheets that the media won't dare tell you. 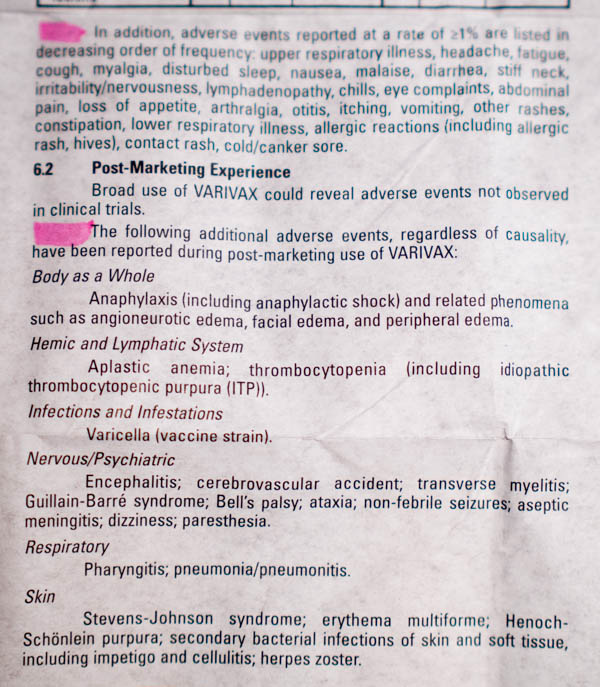 In fact, vaccine pushers hope you never read the insert because they want to keep you in the dark about the side effects and toxic ingredients used in vaccines. They also want you to be completely unaware that many vaccines can actually spread the disease they claim to prevent. Many measles outbreaks, it turns out, occur largely among children who were vaccinated against measles. These are the truths about vaccines they don't want you to know. Rather than have the public be informed, they prefer to slap you in the face with twisted claims of "SCIENCE!" combined with the condemnation, intimidation and censorship of anyone who actually tries to point out what the vaccine insert says in black and white. Yes, reading the vaccine insert in public is enough to have you condemned by the vaccine pushers, even though what you are reading is documented by the vaccine manufacturer itself. 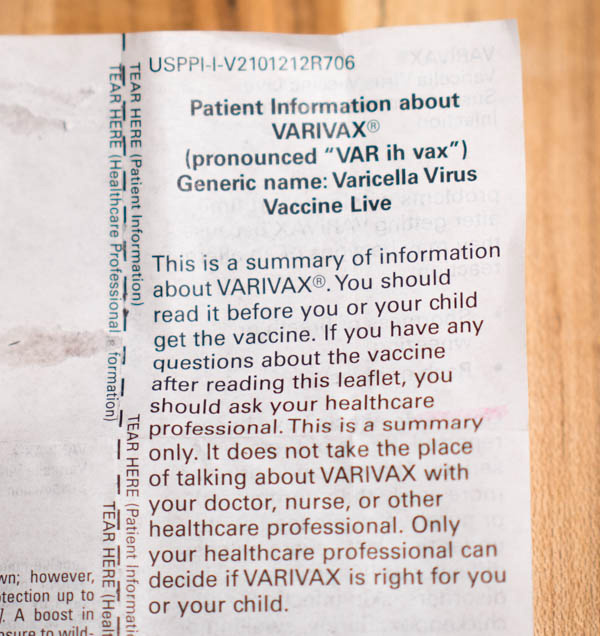 Truly, the vaccine industry today is so corrupt and dangerous that it goes to great lengths to make sure no one reads the information on the insert. Just like the biotech industry, the vaccine industry goes to great lengths to make sure consumers have no idea what they are being injected with or swallowing. 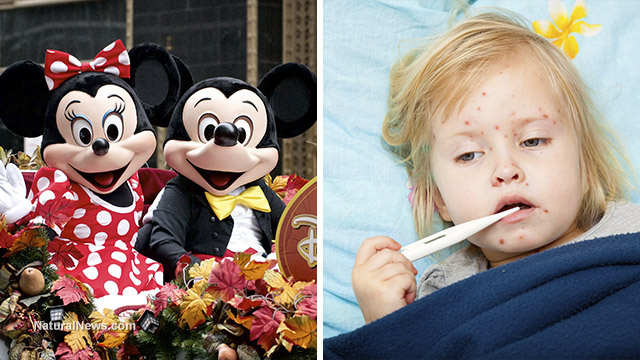 So if you're thinking about getting your child vaccinated against measles because of the Disneyland scare, I encourage you to bring a magnifying glass and go visit a pharmacy or doctor and ask for the measles vaccine insert. If you read it and you're perfectly happy with all the ingredients, side effects and risks associated with that vaccine, then make whatever choice you want, knowing that you've at least conducted some due diligence rather than just blindly injecting your child with toxic chemicals the same way all the obedient sheeple do. Personally, I think injecting children with MSG, formaldehyde, mercury and aluminum is nothing more than medical child abuse. And it turns out many millions of people in America agree with that assessment. In fact, until the vaccine industry cleans up its act and removes the toxic ingredients from its vaccines, vaccine "compliance" will never be very high among the informed.